Maori Money: A giant awakes? Iwi corporates, estimated to be worth $37 billion in 2010, are changing the rules of New Zealand’s economy and politics. Maori capital has been criticised from the red-neck right as rent-seekers, from the pseudo-left as an iwi aristocracy, and from within Maoridom itself. But in two major battles this year, Maoridom’s elite weighed in on the side of the working class. “Thank you Maoris for stopping asset sales!” Willie Jackson joked on his Radio Live show in August, after the Waitangi Tribunal on August 24 recommended National halt its plan to privatise hydro-electricity generating companies until Maori water rights were addressed. The Kingitanga movements national hui on September 13th at Turangawaewae Marae called by King Tuheitia was attended by around 1000 Māori from around the country. The hui has put out the call to stop asset sales until Māori water rights were addressed and to fund a court challenge to the sale of Mighty River Power unless the Government settles issues of proprietary rights over water. In other news, iwi ended a bitter 12-week lockout by the Affco meat company. The union movement rallied behind the Meat Workers Union, collecting up to $50,000 per week during the lockout, but it wasn’t enough to knock back Talley’s Affco. The Iwi Leadership Forum had the economic weight to force Talley’s hand and the interest in the wellbeing of the workers, most of whom are Maori. Maori have always been a factor in New Zealand politics. The most militant trade unions throughout New Zealand’s history have been disproportionately Maori. Leaders like Apirana Ngata, Te Puea, and Ratana all represented the determination of Maori not to be ignored or destroyed in their own land. But Maori money is a new factor. For the racist right-wing, the rise of Maori money is a problem. Sucking up to the rich and hating on Maori are second nature – so its confusing when they are combined. This is a bit rich coming from Muriel Newman, who is a former Act Party MP. Act is the party of the rich pakeha elite. Their main policy is privatisation, which boils down to governments giving an group of elite businesspeople public riches (i.e. state-owned companies) they do not deserve. But so long as the elite is white, it is alright. Newman, without any sense of irony, champions John Key as a defender of the public interest – when he is the one that wants to do away with public ownership of the power companies! At this stage, Prime Minister John Key is standing up for the public interest by reinforcing the widely accepted understanding that water is a common resource that can be owned by no-one. Whether he continues to stand firm is a true test of his leadership. Newman has no problem with the billions that Pakeha bosses have plundered from the public purse, but when it comes to Maori, she sounds the alarm. Newman’s obssession with public ownership finds an echo in the Pakeha “left”. Bryce Edwards, a University of Otago lecturer and Herald columnist, is a former Marxist. He provides space on his “liberation” blog for John Moore to criticise the Maori “aristocracy” and its supporters on the left. Moore draws his ideas from two main sources – Chris Trotter, the self-appointed pope of NZ social democracy, and the World Socialist Web Site (www.wsws.org), a prominent US-based socialist news service. “The [Waitangi] tribunal was established by the Labour government in 1975 to redress grievances relating to land confiscated from Maori people in the nineteenth century. The purpose of the ensuing cash settlements was to cultivate a layer of Maori entrepreneurs by pouring millions of dollars into tribal businesses. The Maori Council, a government-funded body created in 1962, ostensibly to promote the “social and economic advancement of the Maori race,” represents the interests of this small elite. There are some truths in this statement but taken as a history of Maori politics in the 20th century, it is wildly inaccurate. The Waitangi Tribunal was established in 1975 in response to a Maori protest movement that was underpinned by a militant working class and victorious anti-colonial wars around the world (e.g. Vietnam). Labour in 1975 did not simply decide to “cultivate a layer of Maori entrepreneurs” for the hell of it. The primary purpose of the Waitangi Tribunal was to draw the rebels into the system, tie them down in legal procedures, and divide Maori from Pakeha and Pacific Islanders, iwi from iwi and hapu from hapu. It is true Maori as a whole have gained little from the settlements in terms of health, wealth or education. But it is misleading to run the two facts together. Maori tribes have amassed wealth and at the same time, the position of most Maori has worsened but that does not prove at all that one is the cause of the other. The second-class status of Maori is the product of more than 150 years of colonisation. Iwi have only possessed serious amounts of money for a decade at the most. Maori have borne the brunt of free-market restructuring, first redundancies and unemployment in the 1980s (under Labour) and then benefit cuts and anti-union laws in the 1990s (under National). Peters concludes his article by condemning the promotion of “Maori nationalism” that “serves to divide workers along racial lines and directly cuts across a fight for a unified struggle by workers against the privatisations and the government’s austerity program”. Once again, truth is mixed with error to maintain a crude “class versus race” view of Maori struggle. Maori “nationalism” (that is, the demand for a seperate nation state) is only one strand of Maori politics. Recognising that Maori are oppressed as Maori, and not just as workers does not “cut across a fight for a unified struggle”. On the contrary, a unified workers struggle is impossible without recognising it. Maori political activism is interwoven with working class struggle. The very existence of “Maori capital” is due to political struggle. The Iwi Leadership Forum has won capital not by dispossessing members of their iwi, or by exploiting their labour but through transfers of wealth from the State (the Crown). In other words, Maori capital was not gained by a greedy minority dispossessing a weaker group. On the contrary, it was won by decades of political activism supported by the overwhelming majority of Maori and a big minority of Pakeha. What is more, even though traditional iwi leadership played a role in this activism, it’s strength came from the cities, from the urban Maori working class. Many grassroots leaders were trained in the trade union movement and the Maori protest movement of the 1970s and 1980s coincided with, was inspired by, and was underpinned by, the biggest upturn in working class activism of the 20th century. In other words, without working class struggle – Maori, Pacific, and Pakeha – the iwi corporates would have won no wealth. In a sense, the Treaty of Waitangi settlements are concessions wrung from State and from the ruling class in general by a confident and assertive working class movement with Maori part of the leadership. These treaty concessions are a mixed blessing at best though because at the same time Maori whanau bore the brunt of the neoliberal restructuring. But this fact does not mean Maori should never have demanded compensation for the theft of their land and the suppression of their culture. Tom Peters, of wsws.org, and John Moore, of Bryce Edwards’ liberation blog confuse these two issues. This allows them to appear radical while avoiding the reality of working class life in New Zealand, which is far from colour-blind. Moore and Edwards though are tadpoles in comparison with the self-appointed pope of social democracy, Chris Trotter. Trotter is the single most prominent left-wing writer in New Zealand. He is a social democratic ideologue to the core. Trotter has a clear and consistent political theory and an comprehensive grasp of political history, which he applies to news and current events. In his most recent article on the water rights issue, Trotter flatters the iwi corporates – after all they have thrown a spanner in the works of National’s privatisation plans, which he hates. However, he provides a much clearer picture of his ideas in an article published in March last year as a guest post for a right-wing think tank. This myth of Maori as a privileged elite, which flies in the face of all real-world statistics, was popularised by Don Brash in his Orewa speech but owes a great deal to Chris Trotter. According to Trotter, the Treaty was enlightened colonialism. In reality, the main purpose of the Treaty was to give the Crown control over land sales. The state monopoly kept the purchase price of land from Maori low and the sale price high – thus alienating Maori from their land (and driving them into wage labour) and stopping settlers from too-ready access to the land (which would allow them to escape from wage labour). The Crown was afraid too, of disputes over land sales exploding into a war the Empire was unable to fight. Far from being an “extraordinarily generous document” on the part of the Crown, it was extraordinarily generous to the British – which Maori were quickly to come to regret as mass settlement after the signing shifted the balance of power decisively in favour of the British. This history has no place in Trotter’s narrative. According to him, everything was proceeding fine – until Maori lost the plot in the 1970s. Through much travail, and many injustices, the transition of the Maori people – from pre-modern tribalism to full citizenship in a modern state – seemed on the point of fulfilment. In the 1970s, however, New Zealand intellectuals’ faith in this progressive vision faltered. The reality of economic inequality, coupled with the persistence and institutionalisation of racial prejudice, undermined their confidence in the assimilationist policies of successive New Zealand Governments. Maori intellectuals, in particular, rejected the liberal-democratic assumptions upon which assimilation was based. From missionary zeal and Foreign Office liberals, Trotter glides smoothly and gracefully in just six words over the near-genocide of the Maori people! In the twenty years after the signing of this “extraordinarily generous document”, the Maori population declined 30% in the wake of the Land Wars. Trotter does not mention that Chief Justice James Prendergast in 1877, declared the Treaty “worthless” and a “simple nullity”. Nor does he mention that the Maori protest against assimilation did not emerge from “Maori intellectuals” but from the Maori working class, from within the trade union movement – notably Te Hokioi and the Maori Organisation on Human Rights (MOOHR). For social democrats like Trotter, public ownership and the welfare state are magical words, conjuring up visions of our lost land of milk and honey – and not without reason. In 1960, New Zealanders enjoyed some of the highest living standards in the world and wealth was shared far more equally than it is now. But the relationship of Maori and the state is more fraught. The point of the Treaty of Waitangi was to transfer land from Maori to the state (the Crown), which would then parcel it up for Pakeha farmers. Why should Maori have any love for the state, or any soft feelings for public ownership? The contemporary Maori protest movement may have its roots in the union movement but the decimation of that movement made it inevitable that the energy of activists would be sucked into the Treaty process. This does not mean Maori are uncritical of the Treaty process or of the iwi leadership created by that process. Unease at the growing gap between corporate success and poverty led to the formation of the Mana Party last year. Sykes calls the idea that an economic miracle has transformed iwi into the most powerful lobby group in New Zealand a myth, a “carefully constructed illusion”. Maori landholdings are small and returns from land are restricted to about a third of the Maori population. The wealth of iwi corporates is often overstated, with Te Ohu Kaimoana’s $590 million, for instance, equating to only about $1000 per person (taking 523,000 as indicative of the Maori population). What’s more, this iwi elite is riding a reinvigorated tide of Maori discontent. 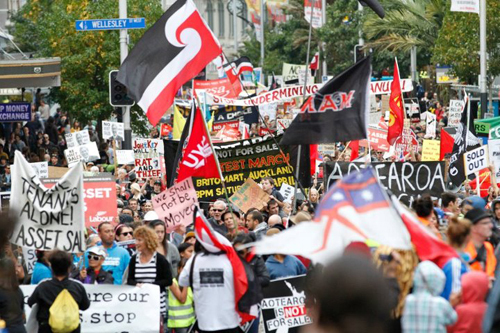 Sykes cites the massive Seabed and Foreshore hikoi – the biggest demonstration in New Zealand in recent history – as evidence of grassroots Maori militancy, which the iwi elite have positioned themselves to benefit from. “Pakeha New Zealand are losers too”, she writes, suffering under the same process of “corporatism” that distances decision-making and denies effective participatory democracy. The solution Sykes put forward in 2010 was “a mass movement that is dedicated to a sustained struggle, including education, participation, engagement, debate, organisation, action and reflection”.